It’s an odd Monday here, windy, cold and a little rainy, not very springlike, but more creepy and kind of feels like an episode of X-Files. I enjoyed this tidbit about a male athlete and vegan, Scott Jurek. Though it does not go into detail on why he is a vegan beyond health reasons, but his blog has some interesting info and protein recipes. Anyway, I had lunch with my mom and we combined our leftovers to create this masterpiece. 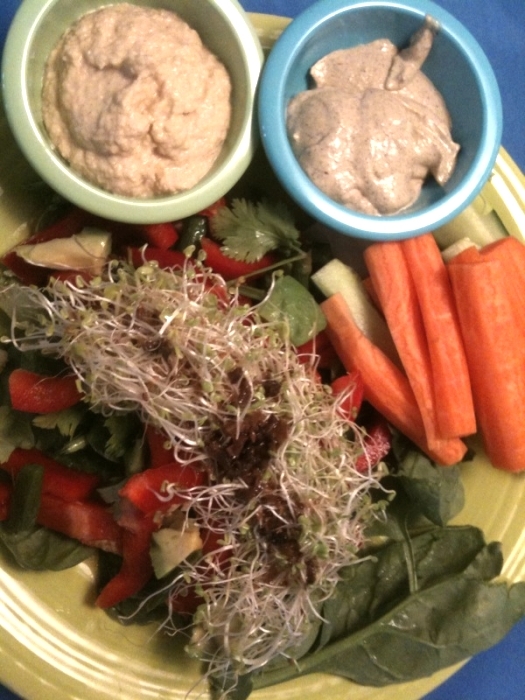 One dipping sauce is my hemp seed “not ricotta” from last night, zucchini hummus, veggie sticks and a salad topped with Annie’s Organic Shiitake dressing, a satisfying blend of veggies. Because it’s cold and gross today, I opted for a hot vegan soup for dinner and got experimental with a cup of dried garbanzo beans I soaked overnight by putting them, 4 cups of water, garlic, curry seasonings, 3 roma tomatoes and pink salt into the Vita-Mix and turned it into a smooth puree. I poured it into a saucepan and simmered on the stove with fresh chopped red onion, zucchini, spinach and cilantro for about 20 minutes, had to add another cup of water to dilute a bit and a dash of cayenne pepper to spice up. 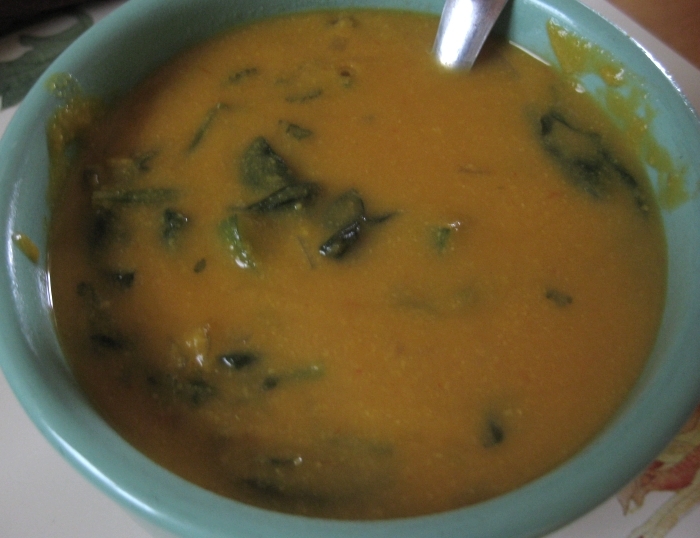 But the end result was a thick, creamy, curry soup that was delicious! The curry flavor was not too strong, the texture was thick and creamy and it was very filling. Hubby liked it so much that I packed up the rest for his lunch tomorrow. I think I remember most of the recipe. :-P But I hope to be perfecting it and posting soon. Funny to think that one cheap bag of dried garbanzo beans has lasted through so many meals and there’s still enough left of it for another recipe. I came home to find a box on our front porch, new shoes I treated myself to. 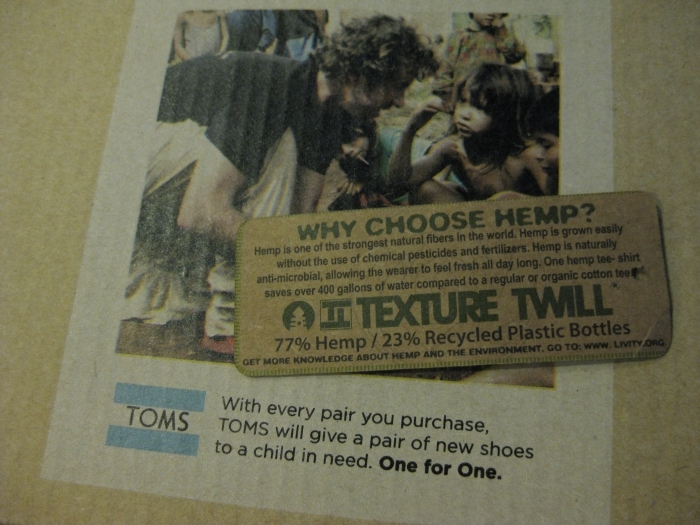 Vegan TOMS and the first pair of TOMS for me, mostly hemp and recycled bottles – are these the perfect shoes for me or what! 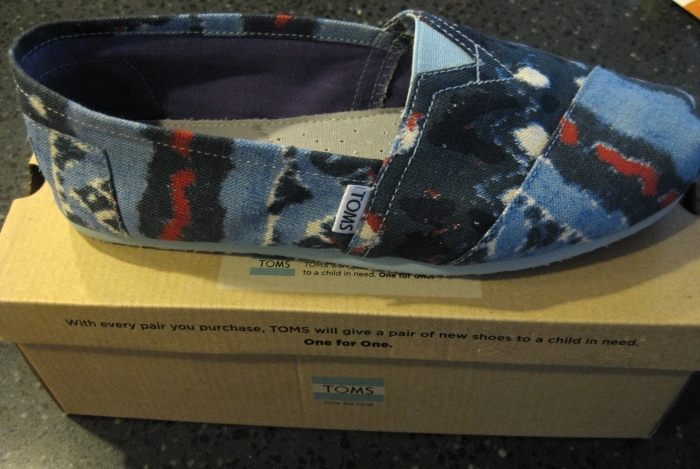 :-) But wow, they’re very comfortable and cute! I was worried they’d make my big feet look bigger, but actually the opposite. FYI, they run a bit big, so chances are you’ll be a half to full size smaller in them. I totally know what I’m wearing for casual Friday! Those shoes are too cute and they look so comfy!! Casual Friday here you come!!!! Ughhhhhhh yeah its another crappy and rainy day here : p where the heck is the sun?! Loving the raw pizza below, u are always making something creative!!! Good luck on the 10 miles too! Im trying to get into running more! Scott Jurek is amazing! I just heard about his latest feat. Those are CUTE!!!! Love ’em! vegan athletes and vegan shoes…so cool! rumor has it mike tyson just went vegan? lol! I have black beans which are dried and every time I want to use them, I forget about the soaking part, so it never happens! I have to plan ahead. Thanks for posting the ingredients!